The SPS30 particulate matter sensor is now available worldwide through Sensirion’s distribution network. 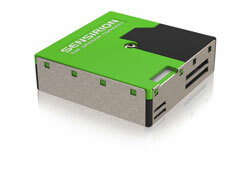 Sensirion: The SPS30 particulate matter (PM) sensor is the next technological breakthrough in optical PM sensors. Its measurement prin-ciple is based on laser scattering and makes use of Sensirion’s innovative contamination-resistance technology. This technology, together with high-quality and long-lasting components, enables accurate measurements from its first operation and throughout its lifetime of more than eight years. In addition, Sensirion’s advanced algorithms provide superior accuracy for different PM types and higher-resolution particle size binning, opening up new possibilities for the detection of different sorts of environmental dust and other particles. With dimensions of only 41 x 41 x 12 mm3, it is the perfect solution for applications where size is of paramount importance, such as wall-mounted or compact air quality devices. Traditional optical PM sensors suffer from contamination, which causes output degradation. Contamination results from contin-ued dust and particle accumulation on the sensor’s optical components, namely the light source (usually a laser or LED) and the photodetector. Consequently, devices integrating these PM sensors stop working correctly after some time, which results in malfunctions, user complaints, maintenance, service and/or part replacement. Sensirion’s proprietary contamination-resistance technology and long-lasting components provide the SPS30 with unmatched robustness, unique long-term stability and high accuracy, together with a lifetime of more than eight years in continuous mode operating 24 hours/day. Visit Sensirion at electronica 2018 (Booth 417, Hall B3) and learn more about the SPS30 particulate matter sensor, Sensirion’s latest breakthrough in environmental sensing technology.